Singapore—Li Shengwu, the nephew of Prime Minister Lee Hsien Loong, posted an update on his case on Monday, April 1. The son of Lee Hsien Yang noted that while the Attorney General did not succeed in getting new rules to be retroactively applied in Mr Li’s contempt of court case, the case will now proceed due to a ruling from the court that the process service on Mr Li was effective. 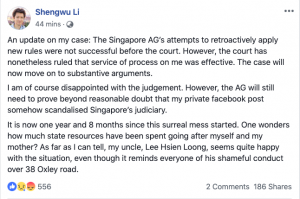 Li expressed his disappointment with the judges’ decision but noted that the onus is now on the Attorney General to prove beyond reasonable doubt that his private Facebook post scandalized the judiciary in Singapore. 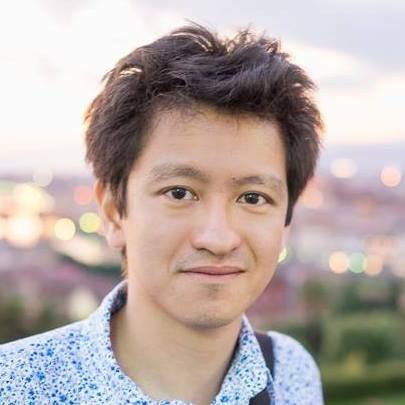 Mr Li, an Assistant Professor of Economics at Harvard University who lives in the United States, also wondered as to the amount of public funds that have been spent on the case against his mother and him. Here is his post in full, “An update on my case: The Singapore AG’s attempts to retroactively apply new rules were not successful before the court. However, the court has nonetheless ruled that service of process on me was effective. The case will now move on to substantive arguments. Mr Li was charged with contempt of court because he allegedly said in a post on Facebook that Singapore has a “pliant court system” and that the Singapore Government was “very litigious”. His post was put up on July 15, 2017, and by August 4, the Attorney-General’s Chambers filed an application in the High Court to start committal proceedings against him for contempt of court. Singaporean media picked up on the post and reprinted it widely, according to the Attorney General, who wrote Mr Li a warning letter asking him to remove the post. Mr Li was also asked to issue an apology on his Facebook account. As for Lee Suet Fern, the mother of Mr Li whom he refers to in the post, in January, a case of “possible professional misconduct” in the preparation of her father-in-law and former prime minister Lee Kuan Yew’s final will was referred to the Law Society by the Attorney-General’s Chambers (AGC). The Attorney General claimed, “In this case, AGC became aware of a possible case of professional misconduct by Ms Lee. Ms Lee appears to have prepared the Last Will of Mr Lee Kuan Yew and arranged for Mr Lee Kuan Yew to execute it, despite the fact that her husband, Mr Lee Hsien Yang, is one of the beneficiaries under the Last Will. In a Facebook post on January 7, Lee Hsien Yang denied that his wife had ever been Lee Kuan Yew’s lawyer. He wrote, “My wife was never Lee Kuan Yew’s lawyer. Our father’s private will was executed some 5 years ago. Our father informed his entire family and his lawyers at Lee & Lee when he completed his will and kept his will at Lee & Lee. This was his re-signing of his 2011 will in which Minister Shanmugam was involved. Lee & Lee had been our father’s lawyers for all his wills since his first will in 1995. That first will was drafted by our mother, Kwa Geok Choo, who was then the principal beneficiary under our father’s will.